I don't know when precisely I got hooked on BoJack Horseman as a television series. It's definitely not my usual far despite how much his sarcastic, self-depreciating humor seems right up my alley. But there's a subtle authenticity to this show that really helps it shine and makes it a far more important piece of entertainment than any silly cartoon. BoJack Horseman is an unusual cartoon, another entry in the collection of animated shows geared towards more adult audiences like Rick and Morty or Archer. Initially it's easy to think it's just another show that takes any excuse to have animated characters curse and drink for laughs. It's something else entire to present them as the sort of self-destructive behavior that people fall into under stress or while coping with depression. So it's a comedy but one with a rather real depict of things. I don't quite want to call it a black comedy either since the humor isn't morbid just for the sake of humor. Or maybe I'm just reading too much into things. Still a surprisingly complex show, though. 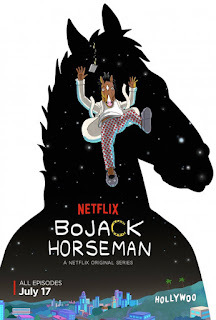 Synopsis: BoJack Horseman is a Netflix adult-oriented animated television series created by Raphael Bob-Waksberg. The show was designed by Lisa Hanawalt. The larger BoJack (Will Arnett) arc this season involves his being cast in the movie Secretariat, the story being personally relevant to him. We're well past the efforts related to the writing of his autobiography and his confused feelings for Diane (Alison Brie), who is now married to Mr. Peanutbutter (Paul F. Tompkins). Now BoJack has a bit more space to try and figure things out but of course this is the last thing he actually does in the show. This season also features a lot of development for Princess Carolyn (Amy Sedaris) in her role as BoJack's agent along with a some movement in her actual company. We have Todd (Aaron Paul) engaging in rather weird side projects including creating what may be the world's most dangerous amusement park. And in time Mr. Peanutbutter moves on to having a new TV show, but not the sort you'd' expect given his part reality TV efforts. What I Liked: A lot of time goes into depicting BoJack in a manner that is eerily accurate in terms of self-destructive behavior. Sure he's always been vocal about him doing things without caring what other people thought. But beyond that the quieter moments when he'd really be wallowing in his misery and regretting this or that decision. And that depiction of his struggle was quite raw at times and thus all the more authentic in terms of feeling and impact. Some really great writing is taking place there. I appreciated the increased attention on Princess Carolyn, who felt more like a caricature of a character in the first season. There's a lot to unpack about her character's story after all and this season gets started on addressing things but we still have a long way to go before we better understand how she got to this point. That being said, there's a fair amount of character developing going on for other folks too and that just stresses how damaged anyone can be when you dig deep enough. What Could Have Been Better: Like I said in my Season 1 review, if you didn't like like BoJack from the start, you're probably not going to like him that much more in this season. He's a flawed character by design and that means a heck of a lot of self-destructive behavior in the show. It can feel brutally realistic at times and I can understand that not everyone can appreciate that. It does feel like Diane really got shoved aside in this season given how she stepped down from being a potential love interest in the first season to a sort of aimless wife in this second one. Perhaps this is the fate of all of BoJack's romantic interests as the introduction of Wanda (Lisa Kudrow) only for her arc to get wrapped up well before the end of the season. TL;DR: BoJack Horseman is a show that remains smart in a rather subversive way. If you can get past the abrasiveness of the characters, you'll come to appreciate the strong writing that fuels this production. Thus the second season gets 4.5 escapist behaviors BoJack retreats into out of a possible 5.